Your opinion counts. We want to know how you rate our services, facility and staff because we want to ensure that we are meeting your expectations and needs. Your evaluation will have a direct impact on improving our practice. You can be assured that all responses will be kept confidential and anonymous. Thank you for making us a better dental practice. 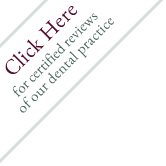 Do you consider our dental practice to be your primary source of dental care? What do you like best about our practice? What do you like least about our practice? Thank you so much for giving us the honest feedback that we need to keep our dental practice at the highest level of performance. If you want to print the completed page for your records, you must do so BEFORE you send us the form.